On Wednesday I decided to try again; I was looking forward to seeing the striking black and white sand I’d read about in books. 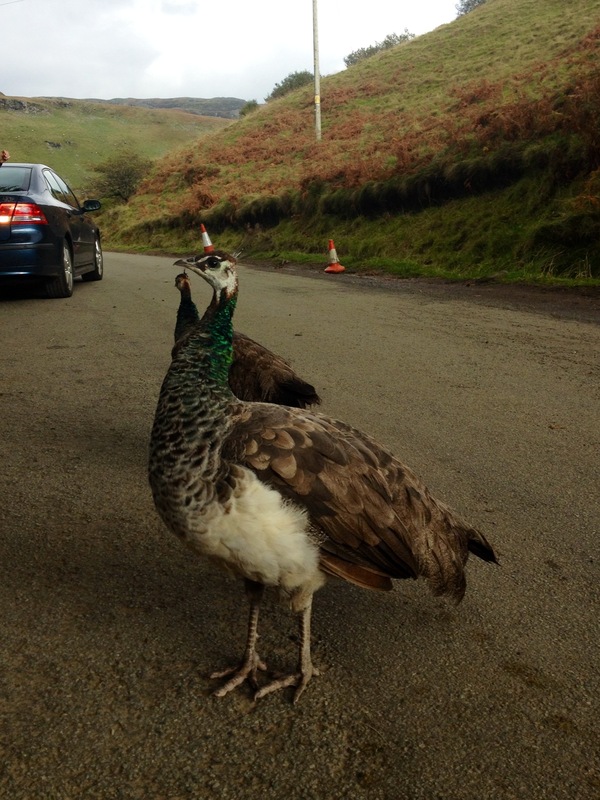 As I left the car at Talisker House I came across some feathered friends. When you think of Skye birds you think of Sea Eagles, Oyster Catchers, Gannets… Less expected is a gang of peacocks (or peahens, to be precise). Nice hat. Is it freshers week? As I approached the huge round stones that separate the sand from the grass my heart sank. Little splashes of colour on the natural monochrome of the beachscape… red buckets, blue ropes, yellow bottles. Always sad to see but not uncommon. The sand was indeed, striking. The water had washed it into patterns that were like looking at a charcoal drawing of a thunderstorm. Though I didn’t have much time to see it; the tide soon came in and selfishly snatched it back under the waves. 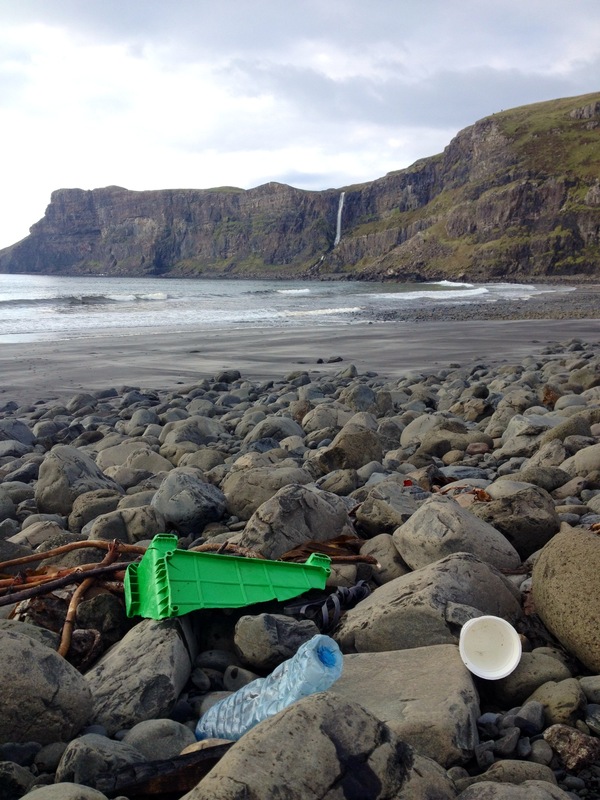 I continued to wander along the tideline and those occassional bright splashes of plastic became more frequent. 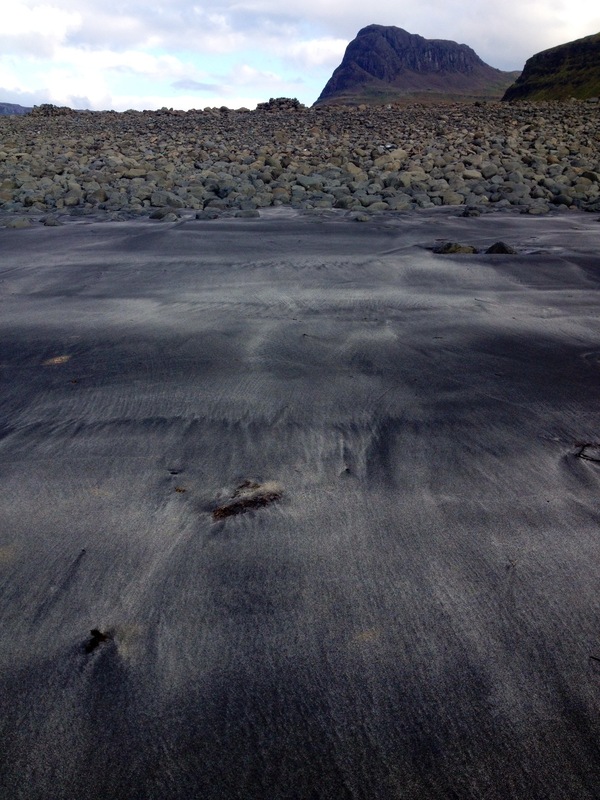 Within a few minutes I’d reached a section of the beach where when I looked down I saw more man-made material visible than natural. I wont get too technical here and go off on a rant about marine pollution issues, although I easily could (and would like to, but I fear I’ll lose you). This stuff is one of the few topics that I know a lot about, mainly through involvement with various conservation groups. Unfortunately, through this knowledge I’ve also seen a lot more case studies of the damage caused by plastic debris than your average visitor to a dirty beach… tangled birds, choked turtles, that kind of crap. It’s genuinely heartbreaking. Rubbish can arrive on our beaches in a number of ways. Some is flushed down into the sewer systems or washed from city streets into storm drains. A small amount is made by people dropping litter on or near beaches. A large percentage comes from the industries using the ocean itself, especially fishing. All marine pollution is bad, of course, but fishing gear is one of the most dangerous to marine wildlife. Discarded nets continue to catch animals indiscriminately as they float around the oceans on whichever current they get caught in; it’s known as ‘ghost fishing’ and it affects everything from tiny seahorses to great whales. A nasty business. 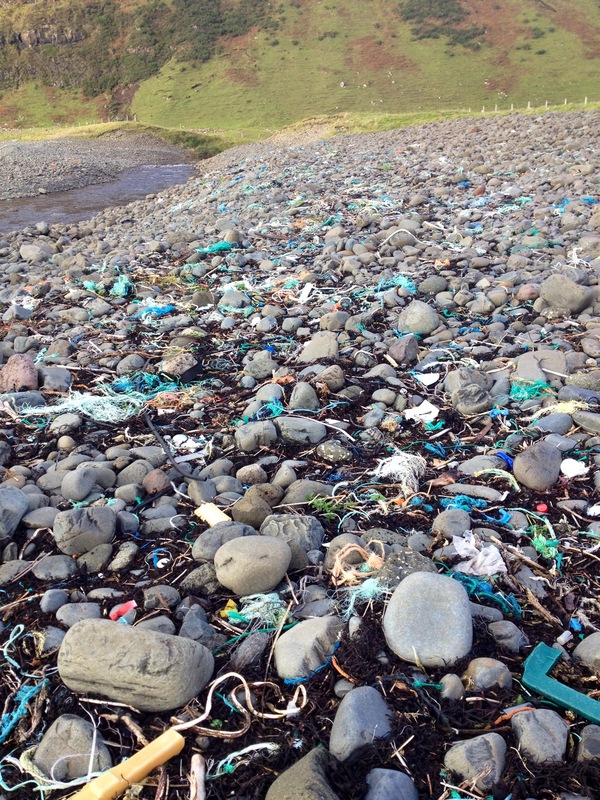 It’s this trash coming from the ocean itself that affects Talisker. Nets, buckets, ropes. Containers with the print washed away from years of being in the water. There are containers that could have easily originated on the other side of the Atlantic over a decade ago. Anyway, I seem to be going on a bit even though I said I wouldn’t… Though if anyone has any questions or wants to know more about this stuff please let me know, the more we share this knowledge the better we are equipped to tackle the issue. I had arrived at Talisker House and merrily bounced down to the track to the beach and then half an hour later and I’m fuming. I kick plastic bottles away angrily as I come across a second seabird carcass (again, too far gone to work out whether it died from natural causes or the nets in which it lay). Who’s in charge of this place? The council? A private owner? If so, why isn’t there enough funding to help a private owner look after it? It’s a popular visitor attraction for goodness sake. Grr. 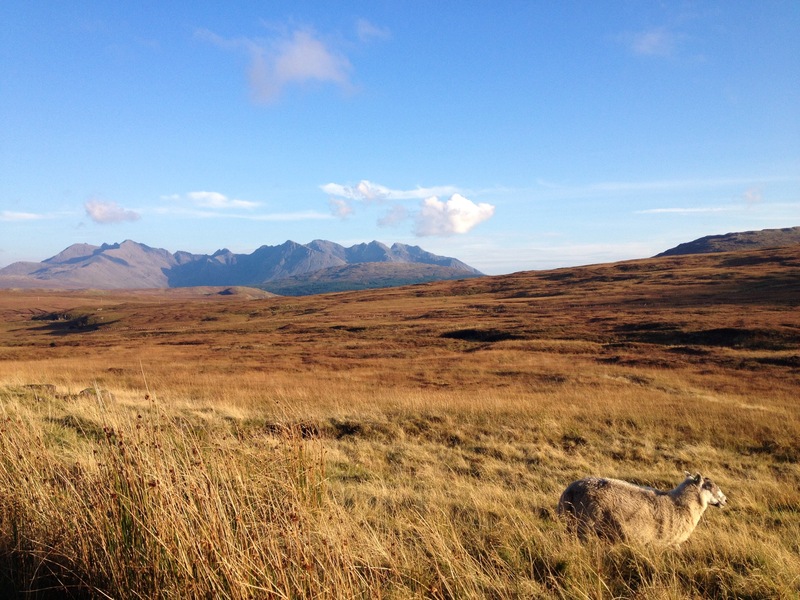 One of the most wonderful things about moving to Skye is that it’s given me time to reflect. 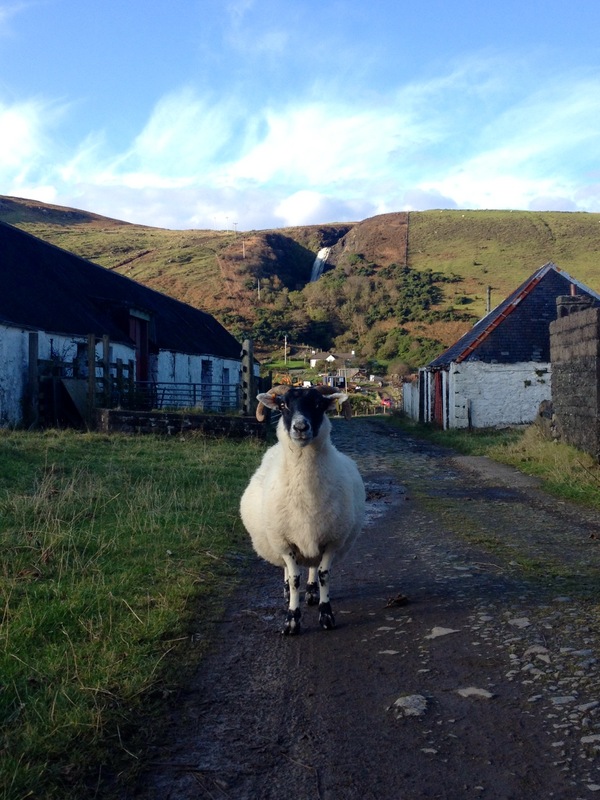 One of the worst things about Skye is that it’s given me time to reflect. Yesterday I found myself saddened by the radio news reports; Turkey’s inactivity over ISIS movements, people calling for aid cuts when Ebola is crippling communities, an so on. I spent the evening wondering how humanity could be so callous. Now I couldn’t understand how we could be so careless. I’ve seen really dirty beaches before but this one, juxtaposed against dramatic cliffs and a stunning waterfall, really got to me. But there’s no point in getting upset about something and doing nothing; anger can positive if you can harness it somehow. Talisker changed my mind. As I stormed back towards the car with stinging eyes I decided that I had to do something. So next Sunday I’ll be hosting my first Skye beach clean event with SAS (11am-2pm, meeting on the beach). Over 150 other people have felt the same way about this problem and will be leading other cleans up and down the UK next weekend. I hope that some of you reading this will consider volunteering your time at an event close to you (it’s surprisingly good fun and you get real feel-good points). The rest of the afternoon was spent going back and forth between the properties around the beach trying to find information about who owned the beach, access rights etc etc -all very dull but necessary stuff for organising a beach clean event. As the shadows began to stretch I left the area in search of a place where I could exhale and forget the rage I felt at the state of Talisker Bay. The Fairy Pools. I’ll talk about the pools at length in another post. It’s an incredibly special place, even for someone like me who thinks all that airy-fairy supernatural stuff is nonsense. There’s just something about them. The landscape looked spectacular in the setting sun as I drove away from Talisker towards Glenbrittle. It was like my anger was butter melting under the hot amber light. This entry was tagged anger, bay, beach, Beach Clean, carbost, Fairy Pools, fishing gear, ghost fishing, glenbrittle, marine conservation, ocean, Peacocks, plastic, plastic debris, pollution, Skye, surfers against sewage, talisker, wildlife. Bookmark the permalink.